Shiraz from Padthaway is full-bodied, dense and fleshy, featuring dark berried fruit with peppery overtones. 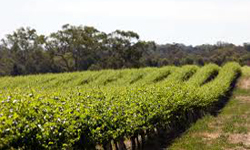 Padthaway is similar to the neighbouring Coonawarra, but warmer. The Limestone Coast is an ancient seabed with scattered ridges of Gambier limestone. In general, the topography consists of gentle slopes between at between 100 and 300 feet elevation. The region is warm to cool, tempered by chilly maritime winds from the Southern Ocean. Spring frosts are not uncommon. Annual rainfall is approximately 21 inches, hence the need for drip irrigation, with water sourced from the shallow water table.